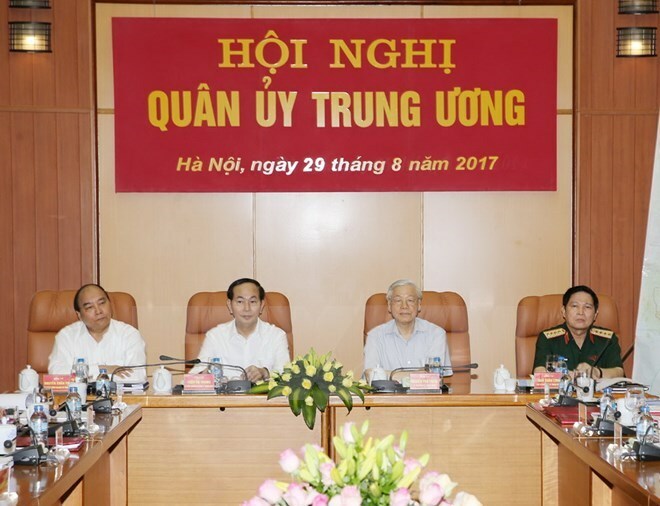 Hanoi (VNA) – Party General Secretary Nguyen Phu Trong hailed the Central Military Commission for well performing its military and national defence tasks during a conference in Hanoi on August 29. The event saw the participation of President and member of the standing board of the Central Military Commission Tran Dai Quang, Prime Minister and member of the standing board of the Central Military Commission Nguyen Xuan Phuc, Defence Minister and Vice Secretary of the Central Military Commission Ngo Xuan Lich. Trong, who is also Secretary of the Central Military Commission, asked the commission and the Defence Ministry to direct the implementation of decrees and resolutions adopted by the Party Central Committee and the Resolution set by the 10th Military Party Congress. He called further attention to improving leadership capacity of the Central Military Commission, ensuring that the army always leads the way in the implementation of the Resolution by the fourth plenum of the 12th Party Central Committee on Party building and rectification, driving back degradation in political thought, moral virtue and lifestyle, and behaviors of “self-evolution” and “self-transformation” in Party rankings. The commission was asked to well serve as a think-tank in terms of national defence and military strategies, ensuring that the army will fulfill assigned tasks and truly become a crucial force to firmly safeguard independence, sovereignty, unification and territorial integrity, as well as defend the Party, State, people and socialism.